#JimiWanjigiChallenge : Jimi Wanjigi humor on the social media as Kenyans create a challenge. #TunukiwaDaily - Bana Kenya News, Real African Network Tubanane. 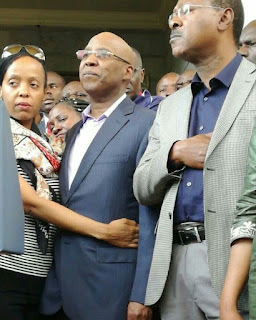 Following the Jimi Wanjigi stampede, people took onto the social media to contest showing how a family behaves and how wives furiously hold their husbands in public. People made humor out of the Jimi Wanjigi press with Raila Odinga and Moses Wetangula in his residence at Muthaiga. Police raided the Nairobi tycoon house where they recovered several weapons just a week after the police raided another house in Malindi which was believed to his house too.